Ships Friday, April 26 if ordered in the next 15 hours and 57 minutes! 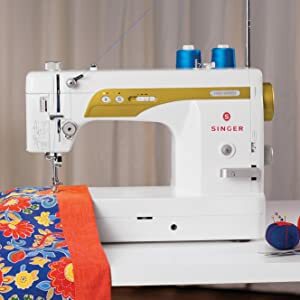 The SINGER S16 Studio True Straight Stitch machine provides you with the power of an industrial strength sewing machine for a fraction of the cost. Stitching up to 1,600 stitches per minute, you will whip through projects in no time. The independent bobbin winding system allows you to wind a bobbin while sewing at the same time! The SINGER Studio quilting and sewing machine’s long arm design allows you to manage draperies and other large projects without worry. Experience the power of an industrial strength sewing machine with the sleek design of a home sewing machine. This machine is ideal for professional sewers, quilters, dry cleaners, alteration shops, and seamstresses. True Straight Stitch Machine - This straight stitch only machine sews with precision. The needle bar is locked in perfect alignment, eliminating wobbly-looking stitches . The specially designed needle plate is perfect for sewing all fabric types, including delicates, without distortion. Extra-Large Sewing Space - With almost 9 x 6 of space to the right of the needle, the long arm design allows you to manage quilts and other large projects with ease. Review "Singer S16 Studio Industrial-Grade True Straight Stitch Only Sewing and Quilting Machine"